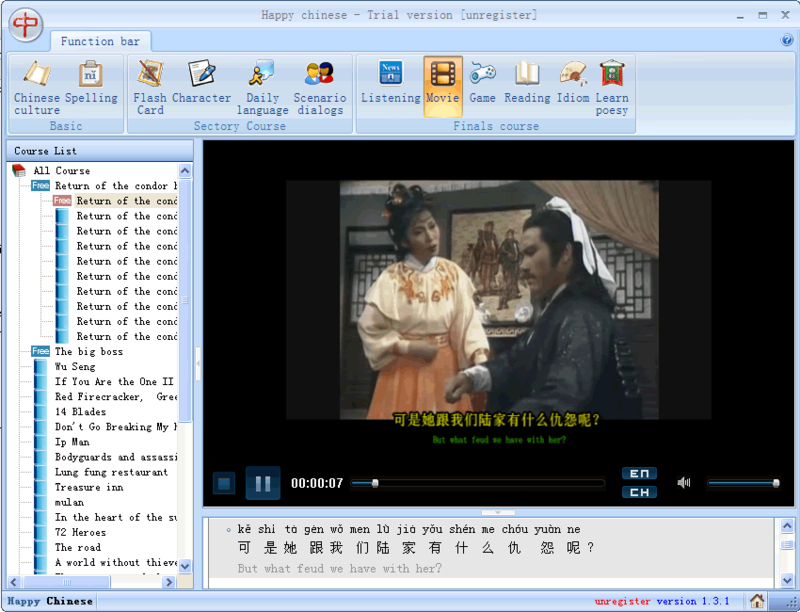 Chinese learning assistant is a comprehensive Chinese language learning software. Feature have pinyin, word, sentences, music and movie courses and so on. It contains overview about the traditional Chinese culture, history and origin of Chinese characters, more than 6700 Chinese characters pronunciation, spelling, English translations, phrases and writing Chinese character stroke animation, comparison recording function can record your pronunciation and playback, and learn Chinese from music or movie. New learning statistics system, you can easy find out your learn situation and Learning progress. Up to 900 commonly used sentences. All sentences have live pronunciation. All courses have a browse mode and learning mode, easy to consolidate learning and know learning status. You can also record your voice compare with live pronunciation. Have all character in simplified Chinese, more than 6763 characters. All character have real voice pronunciation. Each character has English explanations and sentences. Detailed study statistical system, you can count you study time and the learning status of each course. Each categories have some exams for test. Have all character in simplified Chinese, more than 6763 characters. All character have real voice pronunciation. Each character has English explanations and sentences. Various classifiers, easy to find characters. Such as according to pinyin, strokes and HSK. Many learning course and examination, so that more clearly their learning effects. Magic Translator is a multilingual translation software based on Internet resources. There now exists many distributed machine in the world that can do the language translation work from a certain language to another specified language. Can we exploit these free or public domain resources? Magic Translator could be the answer. Magic Translator can now translate any to any among 53 languages: English, French, German, Italian, Spanish, Portuguese, Dutch, Greek, Russian, Japanese, Korean, Simplified Chinese, and Traditional Chinese, Hungarian, Danish, Dutch, Finnish, Swedish, Arabic, Catalan, Croatian, Czech, Hebrew, Norwegian, Afrikaans, Albanian, Belarusian, Bulgarian, Estonian, Filipino, Galician, Haitian, Hindi, Icelandic, Indonesian, Irish, Latvian, Lithuanian, Macedonian, Malay, Maltese, Persian, Polish, Romanian, Serbian, Slovak, Slovenian, Swahili, Thai, Turkish, Ukrainian, Vietnamese, Welsh, and Yiddish. Magic Translator integrates a Microsoft WordPad styled Rich Text editor. So you do not have to launch another word editor to edit your translation sources and results and save to disk your works. The Build-in Web browser can lead you to any website with simultaneous translation. The IE Observer can be integrated into Microsoft Internet Explorer and monitor the websites you are browsing. Just a simple select and click on the button, you can get the specified web pages translated into your own language. Or display the translation result in a newly opened window for comparison. The installation program of Magic Translator and Magic Translator Itself is interfaced with multiple languages. Easy to use! Magic Translator uses multi-threaded technique to speed up passage translation when dealing passage with a total word exceeding 3000. 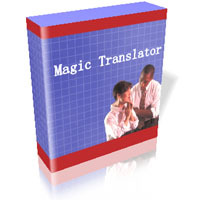 Magic Translator is practical for home and office users worldwide. Translate Web, Webpages, Websites, word, sentence and passage up to 53 languages. The supported languages are English, French, German, Italian, Spanish, Portuguese, Dutch, Greek, Russian, Japanese, Korean, Simplified Chinese, and Traditional Chinese, Hungarian, Danish, Dutch, Finnish, Swedish, Arabic, Catalan, Croatian, Czech, Hebrew, Norwegian, Afrikaans, Albanian, Belarusian, Bulgarian, Estonian, Filipino, Galician, Haitian, Hindi, Icelandic, Indonesian, Irish, Latvian, Lithuanian, Macedonian, Malay, Maltese, Persian, Polish, Romanian, Serbian, Slovak, Slovenian, Swahili, Thai, Turkish, Ukrainian, Vietnamese, Welsh, and Yiddish. You can randomly choose the source and the destination languages and meet your specific need. Web Translator supports either single word translation when you are searching the corresponding word in another language, or sentences translation when you are chatting with a foreigner, or even entire passage translation that meets your specific needs and Web translation when you are browsing foreign laguage content based website. The Build-in Web browser can lead you to any website with simultaneous translation. The IE Observer can be integrated into Microsoft Internet Explorer and monitor the websites you are browsing. Just a simple select and click on the button, you can get the specified web pages translated into your own language. Or display the translation result in a newly opened window for comparison. 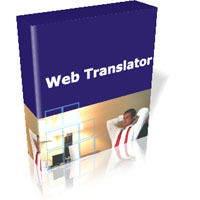 The installation program of Web Translator and Web Translator itself is interfaced with multiple languages. Easy to use! Excellent, unique software designed especially for conquering the IELTS Writing. 6 powerful modules. ▲Practice of Writing 60 typical templates, dealing with all kinds of writing topics. 537 model essays, demonstrating all kinds of writing skills. Additional materials: Essential sentence patterns, Important phrases and sentences, Ultimate weapons for body paragraph, Writing secrets for high score, Materials for IELTS writing, Guidelines for a good answer to task 1, Complete reference for quantifier, Common idioms, Collection of quotations, Selected proverbs, Universal reasons for writing. Hundreds of tested questions are available for practising. ▲Practice of Synonym Replacement Practice of substitution of synonym is absolutely necessary for every aspiring testers. The training in this module is unique, fascinating, and effective. ▲Practice of Typing It is the first one that equipped with powerful function of typing training to improve the speed of input among all IELTS preparation utilities. Including: Train of Fingers(Lower Case, Upper Case, Number, Symbols),Practise Typing by IELTS Vocabulary, Practise Typing by Model Essay, A funny and challenging game( Little Bird Seeking Food.) ▲Practice of Refining Sentence Refine your crude sentence and write typical English. ▲Words for Writing Selected words for highly frequent writing topics. They are helpful to conquer corresponding writing tasks. ▲Simulated Test 93 Academic Task 1; 93 General Training Task 1; 351 Task 2. A set of test questions can be generated based on this huge library. 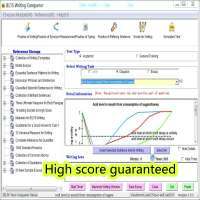 By simulated test, you can inspect your writing skills, and become familiar with the environment of test. One of the products in popular Test Conqueror Series. High score guaranteed. Famous teachers’ recommendation. >>Skill and Speed Practice Module: Practice group reading by Flash Mode, Hiding Mode, Forcing Mode, and Normal Mode. Adjust the speed at will. Come up to the qualified TOEFL iBT reading speed gradually. >>>Library of Tested Articles Module: Complete collection of tested articles(OG, TPO etc.). Test any article at any time. >>>Simulated Test Module: Test your Reading skills in a simulated environment by tested articles in the past(OG, TPO etc., 68 essays in total). You can compare and analyze your answers and correct answers. >>>Special Vocabulary for Reading Module: Important vocabulary for TOEFL iBT Reading, including core words, word pairs tested frequently, common words with special meanings, and essential prepositions. >>>Valuable Materials Module: Collection of striking summaries by famous teachers, including Answering Skills, How to Conquer Ten Types of Question, How to Rule Out Wrong Options Quickly, How to Make Notes, etc. One of the most powerful specialized tools to conquer TOEFL iBT Reading Test. 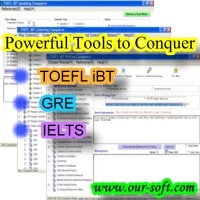 Excellent, unique software designed especially for conquering the TOEFL iBT Writing. 5 powerful modules: Practice of Writing, Practice of Synonym Replacement, Practice of Typing, Practice of Refining Sentence, Test Mode. ▲Practice of Writing The process of improving the ability of writing is the process of learning from model essays for reference and digesting their essence. In this module, you can take advantage of a large amount of brilliant references and templates to practicing writing effectively. Including: Collection of Writing Templates, Classification for 185 ETS Sample Topics and Sample Essays of Score 5, Classic Sentence Patterns, Essential Sentence Patterns for Writing, Absolutely Necessary Sentence Patterns, 200 Key Sentences, Complete Reference for Number and Classifier, Common Verbs and its Objects, Collection of Common Idioms, Collection of Quotation, Gnomology, Collection of Apothegm, 1000 Selected Proverbs, Collection of Brilliant Sentences, Universal Reason for Writing … More importantly, you can practice a large amount of tested questions which may reappear in your test. ▲Practice of Synonym Replacement As for Integrated Writing, you must not copy the key vocabulary in reading passage or lecture into your writing in order to get high score. Practice of replacement of synonym is absolutely necessary for every aspiring testers. The training in this module is unique, fascinating, and effective. ▲Practice of Typing It is the first one that equipped with powerful function of typing training to improve the speed of input among all TOEFL iBT preparation utilities. Including: Train of Fingers(Lower Case, Upper Case, Number, Symbols),Practice Typing by TOEFL Vocabulary, Practice Typing by Sample Essay of Score of 5, A funny and challenging game( Little Bird Seeking Food.) ▲Practice of Refining Sentence Refine your crude sentence and write typical English. ▲Test Mode 7*9 sets of questions. Inspect your writing skills, and familiar with the environment of test.